Relevance can turn static, impersonal documents into highly effective, customized communications. Relevance can enhance virtually any corporate communications whether internal or external, critical or routine, delivered automatically or on-demand to one or to thousands, by e-mail, fax, or voice, to a personal web site, or through web services. Relevance is not limited to strictly traditional sales/client communications. 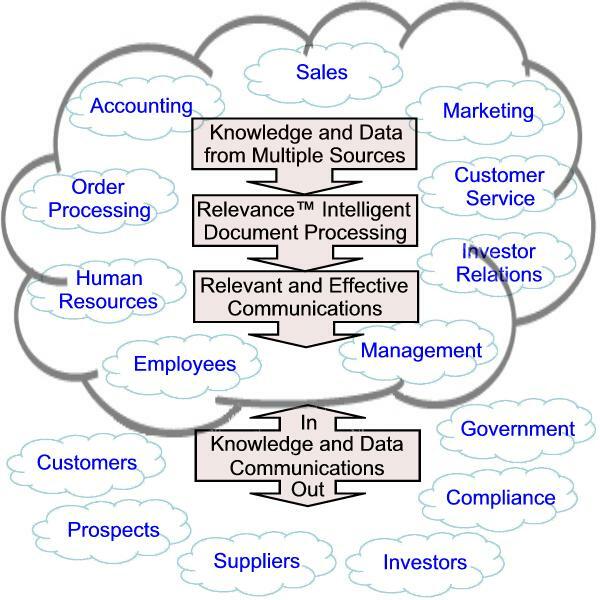 In a corporate environment, there are literally hundreds of applications for the distribution of information through documents, both internally – to various departments, employees, and management, as well as externally – to clients, prospects, suppliers, investors, and government (click your areas of interest on the image below). In addition to function- and department-specific applications, relevance can be effectively used in a variety of corporate-wide areas including Content Management and Distribution, Knowledge Management, Channel Management, Compliance Management, Data Integration, and Corporate Communications. Although the real power of Relevance is unleashed when it is applied to corporate-wide communications, it also stands on its own merits, with a robust and exhaustive feature set that is ideally suited to traditional sales- and marketing-related applications.